This article is a continuation of my previous article regarding Seating Arrangement – I and this article is mainly based on the Seating Arrangement problems. We will see some examples to get a clear picture about , how to choose the best statement among the many statements given and solve the seating arrangements questions within some moments. A, B, C, D and E are five persons sitting in line facing to south – while P, Q, R, S and T are five persons sitting in second line parallel to the first line and are facing to north, They are facing to each other. B who is immediate left of D and sits opposite to T.
C and Q are sits at the extreme end and sits diagonal opposite to each other. E is opposite to R, who is immediate right of P.
S sits immediate left of T and sits opposite to D.
P sits at one of the extreme end. Firstly, understand the given statements correctly, then take notes respectively it will help you to reduce the number of possibilities. Here, Statement states that B sits immediate left of D and opposite to T.
Then C and Q have two possibilities WKT, C is south facing. So, Either C sits in the right end or left end of the south facing line. E faces R and R sits immediate right of P.
S faces D and sits immediate left of T.
WKT, P is facing north so it has two possibilities. Either sits left end of the line or right end of the line. Now, we can directly fix into the diagram with help of the definite statements. A is second to the right of E who is the neighbour of C and G.
D is not the neighbour of A.
G is the neighbour of F.
B is not between D and H. H is not between D and F.
Statement I – states that E is to the immediate right of A. 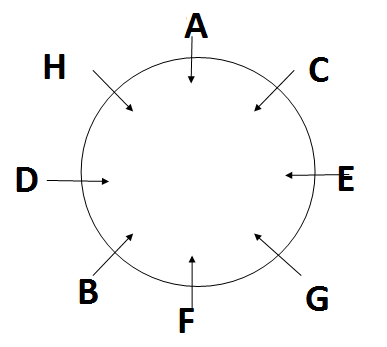 A is second to the right of G.
Statement III – states that F is third to the right of C. F is second to the left of H.
Generally, we will try to solve the problems by taking up point by point from first. But, that is not the right way to approach. We should be very conscious in selecting the statements to solve the problems by searching for definite statement. Here, though statement 1 and 3 are definite clues, we have to pick up statement 3 first as this clue is connected to the statement 2 (as ‘C’ and ‘H’ are discussed in both the statements). In this case, If we take statement 1 then it is difficult to solve the question. I hope this would have provided you with an insight to face the puzzles with a different perspective and I am sure , you will love solving puzzle , if you have the different idea of solving the puzzle in a different way and you will definitely enjoy solving them in the near future. If you still happen to get doubts in solving a puzzle , just drop your doubts in the comment box and I’m sure it will be clarified within sometime. Sir/Mam can we solve the circular seating puzzles by converting them into liner seating arrangement. While i go for this most of time i succeed but when i tried to convert rectangular and square tables puzzles to linear seating, most of the time i got wrong answer. Please can you tell me weather my approaches are wrong or right? ?